Vo Trong Nghia Architects has stunned us again with their incredible vaulted ceilings made from—you guessed it—bamboo. 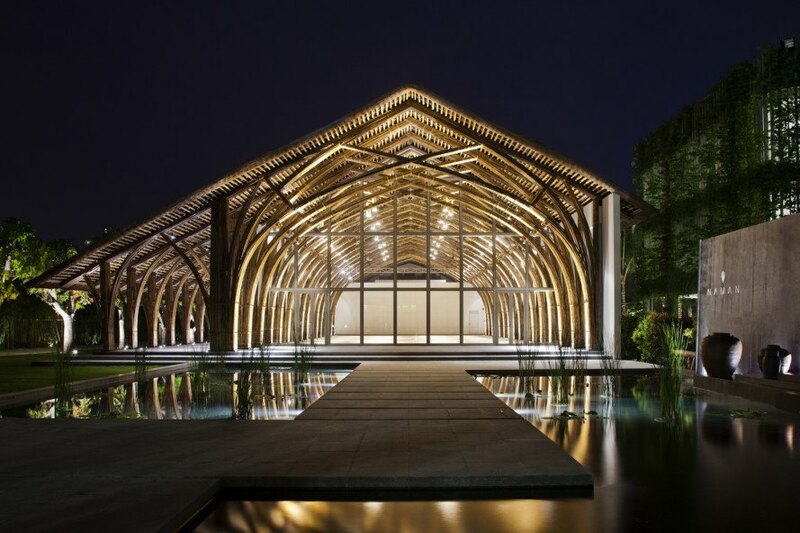 The Vietnamese architects recently completed an airy conference hall, created with two types of locally sourced bamboo, for the Naman Retreat Resort near the coastal city of Da Nang. Bamboo was chosen as the primary material for its local availability, low cost, and fast construction time. The gorgeous arched conference hall is the first building beyond the reception area that welcomes visitors to the Naman Retreat Resort. A long reflecting pond with a floating stone pathway located in front of the building enhances the hall’s majestic appearance. Topped with an asymmetric pitched roof, the building comprises two parallel spaces: a large closed 13.5-meter-wide hall bookended by large glazed end walls, and a 4-meter-wide loggia to the side. 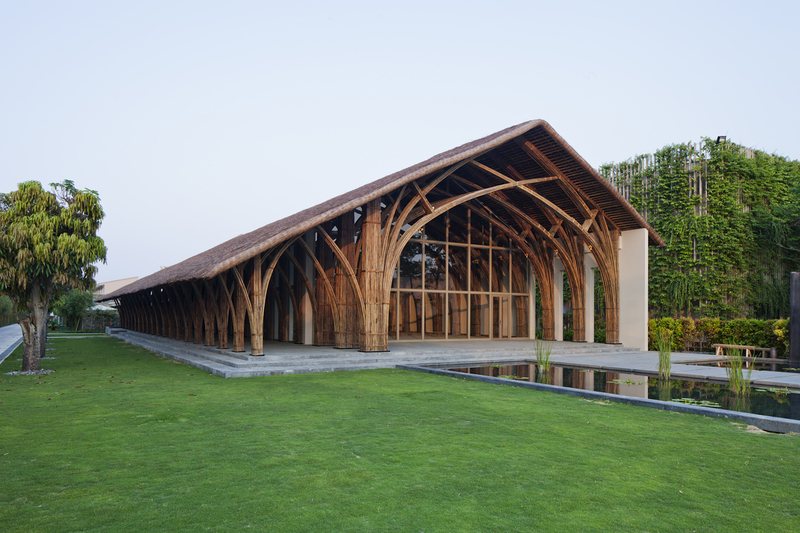 The multipurpose hall can accommodate up to 300 people at once and boasts an airy 9.5-meter roof height supported by load-bearing bamboo arches. The two types of bamboo used in construction include the “Luong” bamboo, chosen for its strength and length (it can grow up to 8 meters tall), and used for the straight columns; and the “Tam Vong” bamboo, prized for its flexibility and used to form the arches. The gorgeous arched conference hall is the first building beyond the reception area that welcomes visitors to the Naman Retreat Resort. A long reflecting pond with a floating stone pathway located in front of the building enhances the hall’s majestic appearance. Topped with an asymmetric pitched roof, the building comprises two parallel spaces: a large closed 13.5-meter-wide hall bookended by large glazed end walls, and a 4-meter-wide loggia to the side. 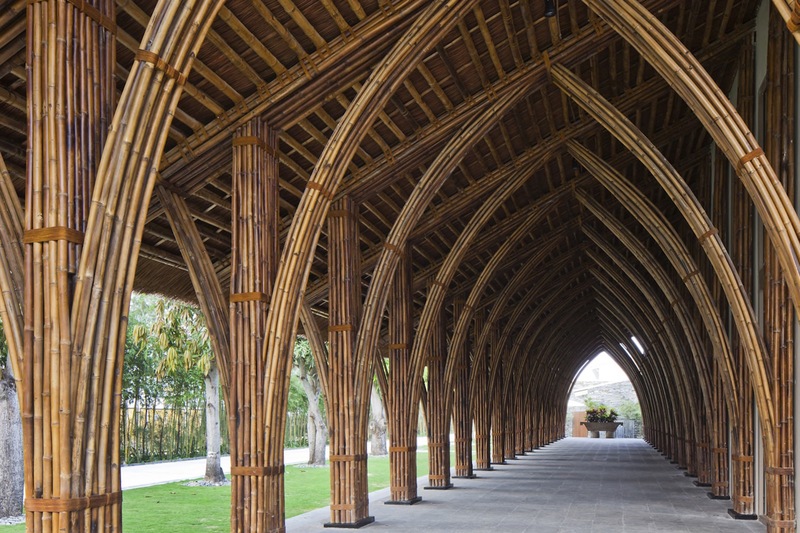 The two types of bamboo used in construction include the “Luong” bamboo, chosen for its strength and length (it can grow up to 8 meters tall), and used for the straight columns; and the “Tam Vong” bamboo, prized for its flexibility and used to form the arches. The conference hall can accommodate 300 people. The hall illuminated at night.